For those of us who didn’t plan ahead and purchase airline/bus/train tickets for the long holiday weekend, driving is the best bet to get over to granny’s house, or whomever you’re trying to visit on the west side of the Cascades. Unfortunately, for the last week or so, the passes have been inundated with snow and ice. 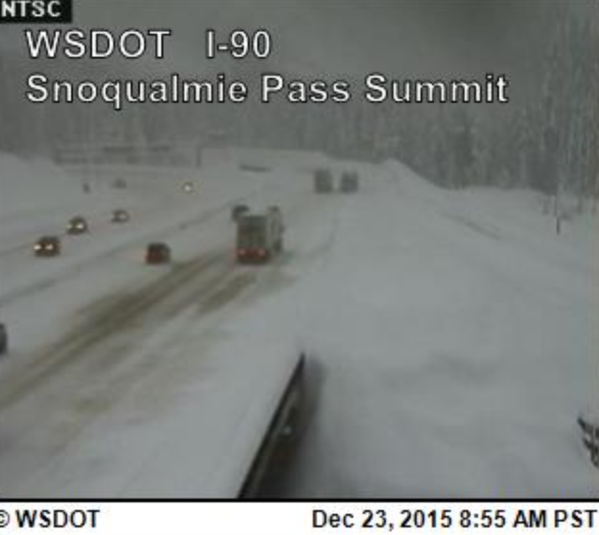 Snoqualmie has already gotten more snow than all of last year. And it’s not getting any better. The KXLY weather forecast predicts that today and tomorrow will remain cloudy with high chances of snow showers. Temps will hover around that 30 degrees mark, perfect for snow. Not so perfect for those trying to get out of town. At this time the passes aren’t permanently closed, but they have been closed on and off today for avalanche control. As Washington State Department of Transportation spokeswoman Barbara LaBoe notes, it is winter travel season. LaBoe says that crews have been working 24 hours a day to plow and clear the roads, but it has been hard to keep up with the snow dumping full force. Her advice is to pay attention to the forecast and check on the WSDOT website for pass instructions. Check here for the I-90 mountain passes and more in North Idaho. Dads can be annoying with all of their caring and whatnot, but sometimes they have excellent ideas to keep you safe while traveling in unpredictable winter weather. Here are some items to have on hand in case you end up in a ditch.